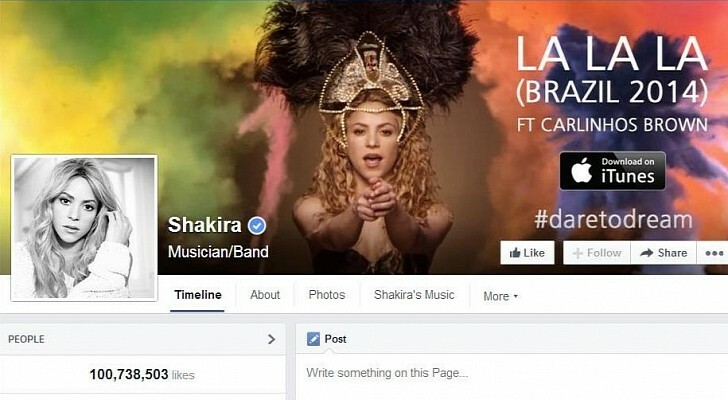 After reaching multiple milestones in the past couple of years, Facebook has reached another one just recently, when Shakira’s page became the first one to have 100,000,000 likes. Guinness World Records has confirmed that the pop star has managed to set a new social media record by gaining the title of the first person to reach 100 million likes on Facebook. “The Colombian singer-songwriter reached the benchmark figure after posting a photo of herself in the Maracanã Stadium in Rio, Brazil last Sunday, prior to her performance during the closing ceremony of the 2014 FIFA World Cup,” the Guinness Book ( http://www.guinnessworldrecords.com/news/2014/7/shakira-sets-new-facebook-world-record-after-reaching-100-million-likes-58881/ ) announced. She managed to reach the milestone way ahead of other big names in the entertainment business, including Eminem (nearly 92 million likes) and Rihanna (89 million likes). Facebook’s Vice President of Global Operations and Media Partnerships, Justin Osofsky, said that Shakira’s global appeal, along with her authentic engagement with fans and use of Facebook as a multi-media platforms, has helped her achieve the milestone. For her part, Shakira is extremely happy with the feat. “I am honored and humbled about reaching this milestone, because it's one that's purely about connecting with my fans from all parts of the globe,” she says. Facebook has put together an impressive 1-minute long video about her journey on the platform since joining back in 2007, making all of her milestones, bringing forth the most loved pictures she posted. Additionally, there’s a special infographic put together by Facebook. According to it, if all of Shakira’s Facebook fans joined hands, they’d wrap around the world four times. Also, they’d manage to fill 1,359 stadiums the size of the famous Brazilian Maracana, the venue for the 2014 World Cup Final. The graphic shows that the singer has 4,642 fans named like herself, and she seems to have more female fans, most of which are aged between 18 and 24. Most of Shakira’s fans come from Mexico City, Cairo and Istanbul. Her top 20 posts have nearly reached 40 million likes in total. A picture posted on the day of the World Cup Final reached 3.5 million likes in just four days, while the most shared picture she ever posted doesn’t even feature her, but her son and Gerard Piqué.